These towels absorb really well for how thin the towels are. The tassels have held up for nearly a year and they have not faded. Excellent towels for the price. Color is true to images shown. Irresistibly soft and ultra absorbent, this Turkish cotton beach towel features natural hand-woven cotton that makes every trip to the beach or pool worthwhile. The herringbone construction of this Turkish cotton beach towel adds to its durability and absorbency without sacrificing softness. Its classic striped design and graphite gray color makes it a great accessory for when you wish to wear it as a shawl or sarong. This Turkish towel features a herringbone construction that ensures it dries fast and lasts for many enjoyable trips to the beach. The towel also gets softer and more absorbent after each machine wash. 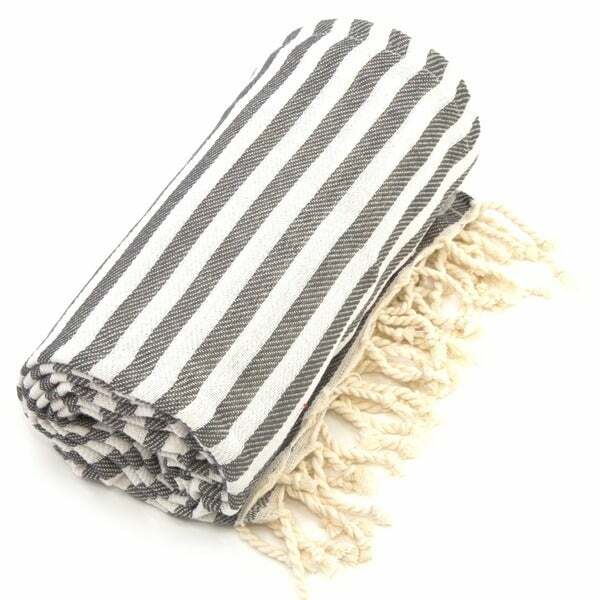 The gray, striped towel looks great with outfits and can alternatively be used as a sarong or shawl. Turkish towels! My new favorite thing! I love the giant size of this towel! Perfect for the beach and especially for the beach chair! I hate having to constantly adjust a regular size "beach towel" when I am sitting or laying on my beach chair. No need with this towel as it is so large that it is taller than I am!!! Love it!!! Finally, an absorbent towel that is the right size! NOT a real "Turkish Towel"
This would have been a price in line with getting a good "deal" on a Turkish Towel, which is what it's being marketed as. It also looks just like the real ones i've seen that go for about $40 each. They may have just used the other brands pictures from their website. Upon receiving this towel i was extremely disappointed and will be returning it. The weave is not tight, it's not reversible as it should be and was overall poor quality. If you're not familiar with the real turkish towel, please invest the extra $10-$20 for one and you will see the difference and not look back. i had read a lot about turkish towels being a great option to the usual terry cloth towels. this is great looking and is a good price. It's not as absorbent as i thought it would be. but it does work great as a beach towel to lay on. These are the best towels ever! Just ordered 6 more. They wash perfectly. I saw the negative reviews but I think a lot of people don't understand how absorbant Turkish cotton is. That's what's so wonderful about them. They are so lightweight yet they do so much and they dry so quickly. I purchased 2 of these turkish bath towels, and ordered the same color for both. When rec'd the colors were both grey, however totally different dye lots. Even though I'm generally happy with the product, I think that a bit more thought could have gone into sending me two that matched better in color. From that standpoint I'm disappointed in what I received, although I know these towels to be quite wonderful. A matching set would have been nice! I would have rated them excellent had they matched. These towels are amazing! I love the colors, the fabric is great! I took them to the beach, it was so easy to shake the sand out, not like other towels that the sand sticks to the towel. Perfect for tossing into your bag without the weight of sand and water getting attached. The color is perfect beach. A little washed yet timeless. Highly recommend for the forward thinking beach goer. I just got my towels today. I was pleased to see that they are as nice as I had hoped. The color is great, will look perfect with my lounge chairs. They are oversized but lightweight and super soft. Cute little towel. This is first time I purchased a Turkish towel so I was a little taken back by the thin texture/fabric. Over all though it's nice. Hits all the right bells and whistles. Feels great.